ADA, Minn. (August 16, 2018) – The penultimate round of Thursday Night Thunder at Norman County Raceway for the 2018 season featured Back to School night. During intermission, kids got to take a ride around the race track on a school bus and enjoyed sweets from the candy toss. The Seedex INEX Legends had a strong 15-car field on hand for the inaugural Minn-Kota Legends Tour. Dean Julsrud and Dylan Johnson led the pack to the green flag with Julsrud taking the early lead. On lap two, the race for the lead quickly heated up as Johnson and Andrew Jochim went three wide with Julsrud out of turn two. Johnson led at the line, but Jochim held the point on the following circuit. A restart on lap four of 16 allowed Tim Estenson to slice his way through the field. Photo: Andrew Jochim of Glyndon claimed the Minn-Kota Legends Tour feature win Thursday at Norman County Raceway in Ada, Minn.
Estenson, who has 23 wins on the season, moved by Ryan Braseth for second with nine to go. For nearly the remainder of the race, Estenson stalked Jochim as they raced nose to tail for the lead. As the white flag flew, Estenson left the preferred top groove and attempted to dive underneath Jochim in the final set of corners. Estenson got sideways and made contact with Jochim, which forced them both to spin. Third-place runner, Braseth, dove off the turn three embankment to avoid further contact. The caution was called on Estenson and Jochim and Braseth rejoined the field in first and second, respectively. Jochim, of Glyndon, Minn., held on to collect the win in what was his first appearance of the season to Norman County Raceway. For the second week in a row, Luke Johnson captured the Titan Machinery IMCA SportMod checkered flag. 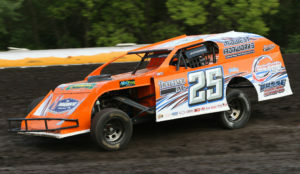 The Moorhead, Minn. driver took the lead from Taylor Grove on lap three and never looked back. In search of his first win of the season, Grove remained within striking distance of Johnson all race long but didn’t have enough to challenge Johnson in the closing laps. The Norman County Implement IMCA Stock Car feature began with a three-wide race for second as Rob VanMil, Tim Church and Rick Schulz battled for position. VanMil claimed the spot and set his sights on the leader, Brandon Schmidt of Hillsboro, N.D. A pair of cautions in the final 10 laps gave VanMil ample opportunity to get by Schmidt, but Schmidt, a rookie to the Stock Cars, broke away from the pack on each restart. Schmidt cruised to his third win of the season at NCR and eighth overall win of the season. WISSOTA Midwest Modified national point leader, Lance Schill of Langdon, N.D., led all 15 laps of the Christian Motors main event. Schill grabbed the early lead over Joseph Thomas. Thomas ran in the second spot until he slid off the track in turn one on lap four. On the ensuing restart, Aaron Blacklance assumed the second position but had his hands full with Reise Stenberg. Another yellow with three to go prompted a restart where both Matt Schow and Brock Gronwold were sent to the tail of the field for aggressive driving. As the race resumed, Schill jumped out to a five car length lead over Blacklance and picked up his third Norman County Raceway win of the season and 17th overall. Tyler Peterson of Hickson, N.D. and Jesse Skalicky had a phenomenal battle for the lead going on in the early stages of the Sanders Metal Products IMCA Modified feature. Peterson tip-toed around the low side of the speedway, while Skalicky rode the rim around the high side. Past the halfway point, the two made contact, which sent Peterson around in turn one. Skalicky was tagged for the caution as Peterson led the field on the restart. Michael Johnson closed in on Peterson in the closing laps, but Peterson held him off to take the win. Next week at Norman County Raceway is your last chance to enjoy Thursday night racing this summer as KRJB 106.5FM presents Season Championship night. ADA, Minn. (August 9, 2018) – The seventh annual Sander’s Metal Products IMCA Modified Challenge Tour came to a close Thursday at Norman County Raceway with a season-high 29 Modifieds. Tyler Peterson captured the opening night win the previous night at Red River Valley Speedway in West Fargo. 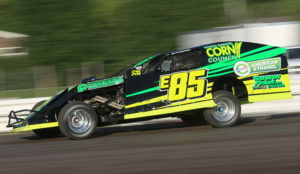 IMCA Modified rookie, Dylan Goplen, showed the way at the drop of the green flag of the $1,300-to-win Modified feature. Goplen had his hands full with Peterson in the early going, but he was able to hold him off. Third-place starter, Johnny Scott, found his groove on the low side of the speedway in the first 10 laps. After getting by Peterson for second in turn four, Scott, of Las Cruces, New Mexico, took the lead from Goplen at the other end of the speedway in turn two. Once out front, Scott, who was driving Austin Arneson’s No. 10 machine, never looked back. Goplen, Peterson, Darin Duffy, and Michael Greseth, who started 12th, rounded out the top five. 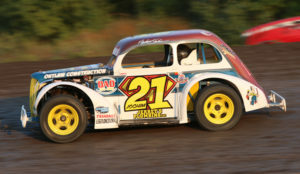 Reise Stenberg of Harwood, N.D. raced to the Christian Motors WISSOTA Midwest Mod feature win. Stenberg started fourth on the grid, but moved by Lucas Rodin, Joseph Thomas and Lance Schill en route to taking the lead. While the rest of the pack fought for position, Stenberg checked out. Stenberg was followed to the checkers by Thomas, Aaron Blacklance, Rodin and Brock Gronwold. Attrition took a toll on the field during the Christian Brothers Ford IMCA Hobby Stock feature. Just three cars remained in the closing laps, but those three drivers produced the most exciting finish of the evening. Todd Gettle led Tim Shiek and William Smith on the final lap, but Shiek and Smith were closing in. In the final set of turns, they went three-wide for the lead as it came down to a drag race to the finish line. Gettle managed to hold on by less than a tenth of a second for the win. Luke Johnson picked up his second Titan Machinery IMCA SportMod win in as many nights. The Moorhead driver backed up his win the previous night at Red River Valley Speedway with a convincing victory at Norman County. Johnson took the lead from fifth in the opening laps and held off Paul Colvin for his second win at the speedway this season. Rick Schulz ran a flawless Norman County Implement IMCA Stock Car feature for his third win of the season. Despite heavy pressure from point leader, Rob VanMil, Schulz ran a steady line around the smooth, dry slick racing surface. Next Thursday is Back To School Night at Norman County Raceway. Fans are invited to wear their school colors to the races! ADA, Minn. (July 26, 2018) – Brandon Schmidt of Hillsboro, N.D. claimed the biggest win of his career Thursday night at Norman County Raceway in Ada, Minn. With a season-high number of Norman County Implement IMCA Stock Cars in attendance for the King Pin Klash, presented by The Bowler, Schmidt picked up his second win of the season at NCR. Rick Schulz showed the way in the early going of the Stock Car feature, but a caution with 10 laps to go regrouped the field. Schmidt took advantage of the restart and took the lead from Schulz. Once out front, Schmidt would not relinquish the lead. Behind him, the best battle on the track was for second. Schulz, Rob VanMil and IMCA Modified regular, Tyler Hall, all fought for the runner-up position. At the checkers, VanMil finished second behind Schmidt as Schulz, Hall, and Kevin Mattox, who made the haul to Ada from the Minot, N.D. area, rounded out the top five. Photo: Brandon Schmidt of Hillsboro, N.D. picked up the big IMCA Stock Car win Thursday at Norman County Raceway. The Christian Motors WISSOTA Midwest Modifieds got off to a wild start as the third-place starter, Lance Schill, looped his No. 17 machine in front of the field. Everyone was able to avoid him and Schill rejoined the pack at the back for the complete restart. As the race resumed, Cody Lee of Starbuck, Minn. held the lead over Aaron Blacklance. Lee had a close call with lapped traffic at the halfway point when he made fairly significant contact with the rear of a lapped car. Lee only suffered cosmetic damaged on his No. 50 machine as he went on to cruise to his first career NCR victory. Matt Schow, Jeff Nelson, Bryan Kakela and Brock Gronwold rounded out the top five. Aaron Wetterlin of Moorhead collected his third win of the season in the Titan Machinery IMCA SportMods. The race got off to a wild start as Chris Evoniuk and Paul Colvin made contact at the drop of the green flag, which sent Colvin spinning in front of the field. Colvin’s car came to rest on the low side of turn one and retired his No. 13 machine from the race. On the restart, Luke Johnson took the lead after running three wide in turn one. Wetterlin, who started sixth, quickly reeled in Johnson and took the point with a slide job in turn two. Wetterlin opened up a somewhat comfortable five car length lead at the halfway point. Wetterlin withstood a challenge from Johnson on a restart with six to go to get the win. 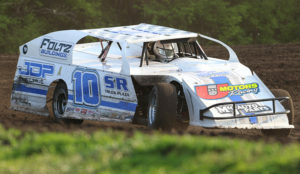 For the second week in a row, Jason Strand of Portland, N.D. picked up the Sanders Metal Products IMCA Modified win. Strand grabbed the lead over Jamie Trautner in the early going and checked out from the rest of the field. As the race advanced, Strand’s lead became smaller with each lap as Tyler Peterson began reeling him in. What was a full straightaway lead was cut down to just two car lengths on the final lap as Peterson had caught the No. E85 of Strand. Strand was able to hold off the hard-charging Peterson at the checkers to claim his second win of the season. Dale Kraling, Brady Petermann, and Bryce Borgen rounded out the top five. Tim Estenson of Fargo raced to his second win of the season at NCR and 17th overall. Estenson took the lead on the opening lap with a four-wide pass for the lead. Estenson went on to lead the remainder of the event but never opened up a comfortable gap as Steven Kuntz remained within striking distance. Kuntz finished second by a mere three car lengths, while Ryan Braseth, Tye Wilke, and Kaitlyn Skalicky rounded out the top five. Racing returns to Norman County Raceway on August 9th, featuring the seventh annual Sander’s Modified Challenge. Green flag drops at 7 pm. ADA, Minn. (July 12, 2018) – Jason Strand’s long-awaited return to KRJB / KRJM Victory Lane at Norman County Raceway came on Thursday in the Sanders Metal Products IMCA Modifieds. Strand, who has been close to getting that elusive first win the last few weeks in both his WISSOTA Midwest Modified and IMCA Modified, picked up a convincing victory leading every lap of the feature. A pair of cautions kept Strand at bay to the rest of the field for the first half of the race. Dale Kraling and Michael Johnson became locked in a battle for the second spot, which allowed Strand to extend his advantage. Johnson finally cleared Kraling for the runner-up spot with five circuits remaining, but by then, Strand was long gone. Strand went on to take the win over Johnson, Kraling, and Tyler Peterson as Jesse Skalicky rounded out the top five. Sean Johnson raced to his first career Petermann Seeds INEX Legends win. Alex Braseth led the majority of the main event before his brother, Ryan, took the point. With three laps to go, Johnson used the high side of turns one and two to take the lead and the win. Matt Schow led the Christian Brothers Ford WISSOTA Midwest Modified feature from green to checkered. With the win, Schow qualified himself for the AFCO Race of Champions at the WISSOTA 100 at I-94 Speedway in Fergus Falls in September. Jeff Nelson, Bryan Kakela, Brock Gronwold and Eric Haugland rounded out the top five. Rick Schulz held off Brandon Schmidt and Rob VanMil on the start of the Christian Motors IMCA Stock Car feature. Schulz held onto that lead until he slipped over the turn one embankment, handing the lead over to Schmidt with six laps to go. With three circuits remaining, Rob VanMil started working the high lane and snuck by for the lead. Schmidt found a way back by VanMil in the closing laps to pick up his first Norman County Raceway Stock Car feature win. The Titan Machinery IMCA SportMods got off to a wild start. Taylor Grove got loose in the marbles coming out of turn two and spun into traffic, collecting Kreig Kasin, Luke Johnson, Aaron Wetterlin and defending track champion and current point leader, Andy Wagner. Wagner’s machine got upside down in the incident, thankfully Wagner was able to walk away uninjured. Just five cars remained for the ensuing restart as Paul Colvin led the way. A caution set up another restart. Kelly Jacobson took advantage of the opportunity and took the lead from Colvin. Once out front, Jacobson never looked back as he claimed his second win of the season at Norman County Raceway. Next Thursday night is Luau night at Norman County Raceway. 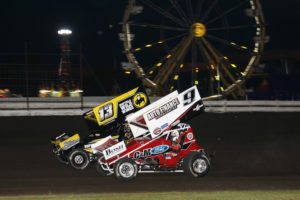 Buffalo Wild Wings and Norman County Implement will bring in the NOSA 410 Sprint Cars and IMCA Hobby Stock Shootout. The event will be the last appearance of the season by the 900+ horsepower winged Sprint Cars. All weekly classes will also be in action. ADA, Minn. (June 28, 2018) – Tyler Hall of Fertile has won in just about everything at Norman County Raceway. From Four-Cylinders, to Mod Fours, to Midwest Mods. He even claimed the 2017 IMCA Modified track championship. 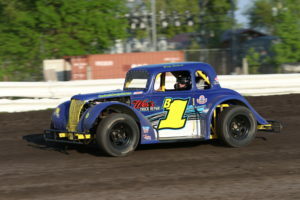 However, Hall, who is in his third year in the IMCA Modified division, had yet to win a Modified race at the high-banked three-eighths-mile dirt oval. Photo: Tyler Hall of Fertile claimed his first career IMCA Modified win at Norman County Raceway on Thursday night. Hall jumped into second in the early going of the 20-lap Sanders Metal Products IMCA Modified feature as fellow Fury Chassis pilot, Jesse Skalicky, showed the way. Hot on their heels were a trio of Black Widow Chassis drivers: Jason Strand, Dale Kraling, and Tyler Peterson. Skalicky and Hall distanced themselves from the back as it looked as though Skalicky, who was also in search of his first Modified win at Norman County, was the car to beat. With six laps to go, Skalicky missed the groove in turns one and two ever so slightly, which opened the door for Hall. Hall capitalized immediately and made the pass for the lead inside of Skalicky. Skalicky did the best he could to battle back, but Hall was too quick as he went on to secure that coveted first Modified win at his home track. Skalicky, Peterson, Kraling and Michael Greseth rounded out the top five. Rob VanMil of Barnesville picked up his fourth Norman County Implement IMCA Stock Car win of 2018. Rick Schulz grabbed the lead on lap one, but suffered a push out of turn four, giving an opportunity to VanMil. VanMil took the lead exiting the corner to lead the opening lap and never looked back. The Titan Machinery IMCA SportMods had the most exciting feature of the evening. The event got off to a ragged start as four cars were collected in an incident on the opening lap. When the race resumed, SportMod rookie Brady Moore held the point over second-year driver Brandon Tendeland. Kelly Jacobson entered the mix in the early stages as well and made it a three wide race for the lead on lap three. Jacobson and Tendeland made contact in turns one and two, which sent Tendeland around. On the ensuing restart, Jacobson took the point and held it until the hard-charging Vince Jegtvig drove around the outside of him to take the lead with nine to go. Jegtvig looked strong on the top side of the speedway, but Aaron Wetterlin began creeping closer and closer in the final laps. Wetterlin, who was the only driver in the top five running the extreme bottom groove pulled even with Jegtvig as they came to the white flag. Jegtvig still had the advantage down the back straightaway, but Wetterlin stole the lead in the final set of corners. It came down to a drag race to the AuctionBlock.com Flagstand, where Wetterlin held on to win by a half car length. Jegtvig, Jacobson, Andy Wagner and Tendeland rounded out the top five. Joseph Thomas started on the pole of the Christian Motors WISSOTA Midwest Modified feature and led until Sam Zender and Aaron Blacklance moved by on lap three. Blacklance, who started fourth, took the top spot away from Zender the following lap and looked to distance himself from the rest of the field. Eighth place starter, Lance Schill, moved into second and set his sights on Blacklance for the lead. Schill closed the gap to within four car lengths, but couldn’t get any closer. Schill drove his car deep into turn three on the final lap, pulled even with Blacklance, but Blacklance’s momentum carried him to the win. 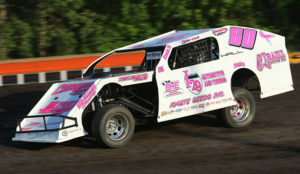 Norman County Raceway will be off next week but will return to action with Ladies’ Night on July 12th. Green flag drops at 7 pm. 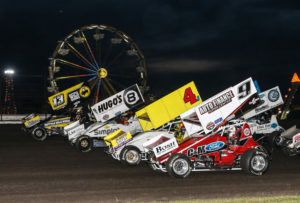 ADA, Minn. (June 21, 2018) – The Buffalo Wild Wings NOSA Sprint Cars made their first of two visits of 2018 to Norman County Raceway Thursday for night two of the Ada Nationals at the Norman County Fair. 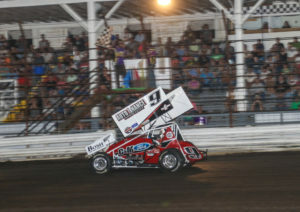 A capacity crowd was on hand to witness twenty-four 900+ horsepower Sprint Cars take on the high-banked three-eighths-mile oval. Wade Nygaard of Grand Forks raced to his sixth career win at NCR by night’s end in what was a wild Sprint Car main event. Nygaard and all-time NOSA wins leader, Mark Dobmeier, led the field to the green flag. Dobmeier grabbed the early lead over Nygaard as Thomas Kennedy slid past Jack Croaker for third. On lap four, Nygaard found some bite around the outside of turns one and two and drove around the outside of Dobmeier for the lead. Dobmeier fought back on the inside in turn three as the two veteran drivers traded the top spot back and forth. The two swapped slide jobs once more in turns one and two before the caution slowed them on lap five. The race endured a long green flag stretch around the halfway point as Dobmeier and Nygaard distanced themselves from the rest of the field. Kennedy ran in third until he made contact with a spinning lapped car. The final caution flew with four laps to go and set up a dramatic finish between NOSA’s two most accomplished drivers. Dobmeier got the jump on the restart and opened up a somewhat comfortable lead over Nygaard, but with two laps remaining, Dobmeier’s Buffalo Wild Wings No. 13 machine suffered a mechanical failure in the rear end, which forced him to pull into the infield. Nygaard inherited the lead coming to the white flag and cruised to the win. Austin Pierce, who started 21st, got by Nick Omdahl on the final lap to secure the second position. Andy Wagner of Ada has been nearly unstoppable in the Titan Machinery IMCA SportMods in 2018. Coming off a win Wednesday night, he was poised to sweep the week at his home track, but he came up just short. Brady Moore took the lead at the drop of the green flag, while fourth-row starters, Kelly Jacobson and Wagner began slicing their way through the field. Vince Jegtvig took the lead from Moore on lap three as Taylor Grove moved into second. With seven to go, Wagner and Jacobson moved into second and third respectively. A caution the following lap put them right behind Jegtvig for the restart. Jacobson took second as the race resumed. He then set his sights on Jegtvig for the lead and took the position after a three-lap battle for the point. Wagner followed Jacobson into second, but Jacobson was untouchable in the final circuits as he took the win. 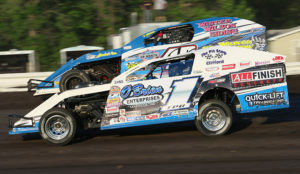 The Christian Motors IMCA Hobby Stock feature came down to a pair of Brainerd-area brothers. Tim and Joe Gonska battled for the win in the closing stages of their feature. Tim went on to edge out Joe at the checkers for his fifth overall win of the season. After finishing second in the Petermann Seeds INEX Legends feature on Wednesday, Tim Estenson found KRJB/KRJM Victory Lane on Thursday. Estenson started fifth on the grid before getting by Tye Wilke and Alex Braseth en route to the win. 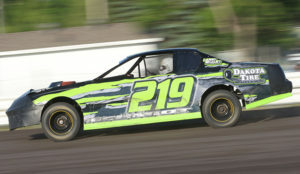 Racing continues Thursday, June 28th at Norman County Raceway with Military Appreciation Night. ADA, Minn. (June 20, 2018) – Race fans were treated to Wednesday night racing at Norman County Raceway as a part of the 123rd Norman County Fair. Kaitlyn Skalicky of Fargo has been racing with the Petermann Seed INEX Legends for the last six years. On Wednesday, she finally claimed that elusive first career victory. Starting on the outside of the front row, Skalicky took the early lead over Alex Braseth. Meanwhile, Tim Estenson, who already has 10 wins on the season, sliced his way through the field from the eighth starting position. A restart with seven to go reset the field. Skalicky, Estenson, and Braseth raced three wide for the lead and Estenson looked to split the middle to take the lead. Skalicky had the momentum on the high side and remained side by side with Estenson into turn three and reclaimed the lead exiting the corner. Estenson mounted several charges on Skalicky in the final five laps. On the final lap, Estenson pulled even with Skalicky in turns three and four, but the bottom groove didn’t have the traction the top did as Skalicky won the drag race to the checkers. Ada’s own Andy Wagner continued his dominance in the Titan Machinery IMCA SportMods. Wagner, who is the defending SportMod track champion, notched his third win of the season from the pole position. Taylor Grove jumped out to the lead from the outside of the front row at the drop of the green flag. Wagner filed into second as Vince Jegtvig, Aaron Wetterlin and last week’s winner, Luke Johnson, raced for third through fifth. Wagner remained within striking distance of the lead all race long and placed a bid for the lead with seven laps to go. Wagner dove to the inside of Grove, but Grove ran in the preferred high groove and held on to the point. In the final five laps, Wagner was never less than two car lengths away from Grove as he prepared to mount another charge for the lead. With two laps to go, the leaders approached lapped traffic. That’s when Wagner made his move. Wagner found an opening around the outside of Grove to pull even with him out of turn two. However, there was a lapped car in the way of Wagner so he went a lane higher down the backstretch, dipping the right side tires off the track. Wagner cleared for the lead in turn three before the caution flew the following lap. Wagner held off the pack on the final green-white-checkered restart to claim the win over Grove. Rob VanMil of Barnesville led every lap of the Norman County Implement IMCA Stock Car feature. 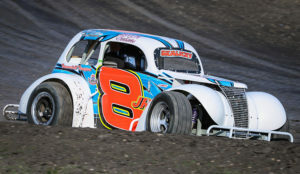 Friday’s winner at Red River Valley Speedway in West Fargo, Brandon Schmidt, threatened to take the lead on the final lap, but VanMil held on for his third Stock Car win at NCR. Michael Greseth of Harwood, N.D. picked up the opening night win in the Sanders Metal Products IMCA Modifieds to snap an 11-year winless streak at NCR back in May. On Wednesday night, he cruised to his second win of the season. Greseth and Jesse Skalicky led the field of 16 cars to the green flag. Greseth pushed in turns one and two, which allowed Skalicky to take the lead down the backstretch. Greseth reeled in the rookie Modified driver and took the lead exiting turn four to lead lap one. Once out front, Greseth checked out from the field. Greseth comfortably took the win by nearly six seconds, equating to over a full straight away, over Rob VanMil. ADA, Minn. (May 31, 2018) – Norman County Raceway’s centennial anniversary season continued Thursday night at the Norman County Fairgrounds. The fan-favorite meet-n-greet, presented by Kelly’s Chrysler Center and Lee Bros. Sales, drew a strong crowd. Kids and adults alike met their favorite drivers, got autographs, candy, and other giveaways during intermission. Tyler Peterson made his 2018 debut at NCR on Thursday night and wasted no time getting to victory lane. The Hickson, N.D. driver drove from the fifth row to win the 20-lap Sanders Metal Products IMCA Modified feature. At the drop of the green flag, a three-wide race for the lead broke out between Brady Petermann, Justin Jones, and Tyler Hall. Jones led the opening lap as Petermann and Bryce Borgen filed into second and third, respectively. At the halfway point, Petermann placed a bid for the lead on Jones and took the top spot. Peterson followed in Petermann’s tire tracks and moved into second. Tyler Peterson (1TPO) and Rob VanMil (4D) race side by side during IMCA Modified heat race action Thursday at Norman County Raceway. With five circuits remaining, Peterson had reeled in Petermann and drove to the outside to take the lead exiting turn two. Peterson withstood a restart with two laps to go to take the win. Lance Schill made the haul to Ada from Langdon, N.D. for the second consecutive week and left town with the Christian Motors WISSOTA Midwest Modified feature win. Schill jumped out to the early lead from the pole position as Brock Gronwold moved into second. Schill quickly put several car lengths between himself and Gronwold and held a comfortable lead until the caution waved with four laps to go. On the restart, Gronwold placed a bid for the lead in turn one, but Schill was able to fend off the charge. Jason Strand took advantage of the restart to move into third from the eighth starting position. Schill held off Gronwold on the final lap to claim his first-ever win at NCR. Andy Wagner’s Titan Machinery IMCA SportMod track championship title defense is off to a good start. Wagner picked up his second consecutive win to start the 2018 season. Noah Metzger grabbed the early lead at the drop of the green, but Aaron Wetterlin stole the point on lap four as Wagner followed him into second. With 11 laps to go, Wetterlin looped his No. 3W machine right in front of the field. Wagner inherited the lead but had his hands full with Kelly Jacobson in the closing laps. Wetterlin drove through the field and became a contender in the late stages, but Wagner hung on for the win over Jacobson and Wetterlin. Rick Schulz cruised to the Norman County Implement IMCA Stock Car feature win. The Horace, N.D. driver led every lap of the race to pick up his first win of the 2018 season. Tye Wilke also visited KRJB 106.5FM Victory Lane for the first time in his career. Kaitlyn Skalicky and Chad Sogge battled for the race lead early on. Sogge took the position and held the point until seven laps remained. Sogge’s machine suddenly slowed off turn four, which handed the lead over to a hard-charging Wilke. Wilke cruised to the win as Dean Julsrud stole second at the line over Sogge. Racing continues next Thursday night at Norman County Raceway, presented by Titan Machinery. All weekly Thursday Night Thunder divisions will be in action, plus IMCA Hobby Stocks. Green flag drops at 7 pm.